When it comes to selecting that perfect center piece for your living room it can often be challenging considering all the options available. 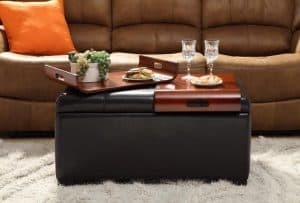 You have to consider all the purposes a coffee table serves from holding books, magazines, and drinks to even kicking your feet up at the end of a long day. Seems simple but the right coffee table can make all the difference. I personally like a nice vintage looking rustic coffee table because of that natural finish they have which says home to many of us. 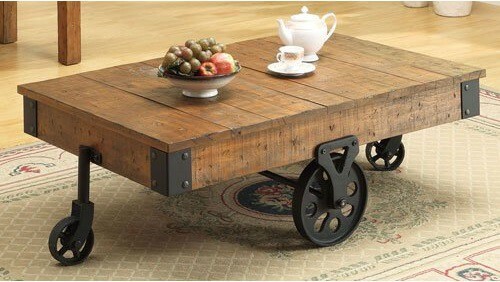 This is my all time favorite rustic coffee table. Be sure to read my blog post detailing why. 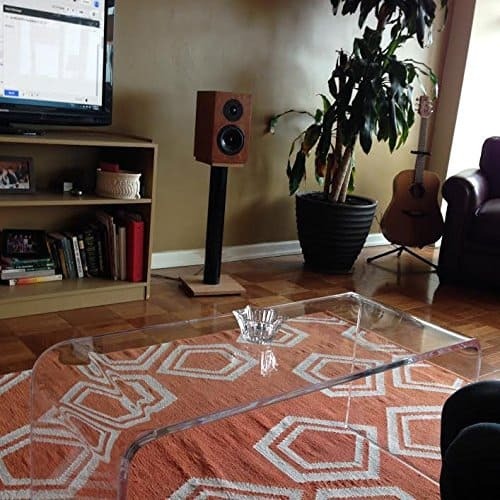 However, I do realize everyone has different “tastes” so I will begin by discussing the basics including correct dimension’s, height and spacing of your ideal coffee table. I’ll then further explain the different types of coffee tables available and which style will fit you best. First you should think about the space between the coffee table and the edges of your sofa. Do you want to be able to kick your feet up quickly and comfortably? Grab that cup of joe and effortlessly put down that magazine? I’ve found that the best spacing between your coffee table and sofa should be around 17.5-19 inches. Plus or minus a half an inch. With this kind of spacing achieving the above tasks should be no problem for you or your guests. Next what about the main passageway? Yes, obviously you want to be able to get in and out of your living room. We don’t want to have to push the coffee table around as this would be inconvenient. The main passage between your coffee table and television should be at least 32 inches. You can however adjust this to a narrower passageway if you have a smaller living room. Make your adjustments according to the amount of space available in your own living room. The last thing you want is a coffee table that just feels like it’s in the way as opposed to serving a purpose.I’d like to add not to overthink the fine details too much as slight adjustments can always be made. Remember you just want to be able to bring your living room together around a centerpiece coffee table. A great example of ample amounts of space around the table. On to the height of the table. The height of your coffee table should generally be below your sofa seats. I recommend 1 or 2 inches lower. The reason for this is because you want easy access. For example, enough space to easily set down that plate of pie or hot coffee. Keep in mind the above recommendations of passageway and height spacing are stated from my own personal experience. Use it as a sort of “blueprint” to help you determine the dimensions of the coffee table you plan on getting. Well now that we’ve gotten that out of the way, on to the different styles! Types and styles of coffee tables. For those of you who have already started searching. I would imagine you’re probably overwhelmed by all the different types and styles of coffee tables available. Should you get a rustic coffee table or perhaps reclaimed wood? Maybe a rounded glass table or perhaps an acrylic table with storage drawers? I admit it’s difficult to make a selection because it always feels like you’re making the wrong choice. Don’t panic! I too have experienced this feeling as well. Just know that whatever you decide to go with in the end will look great! A great example of the many styles of tables out there. This one is called an acrylic coffee table and you can read about them here. 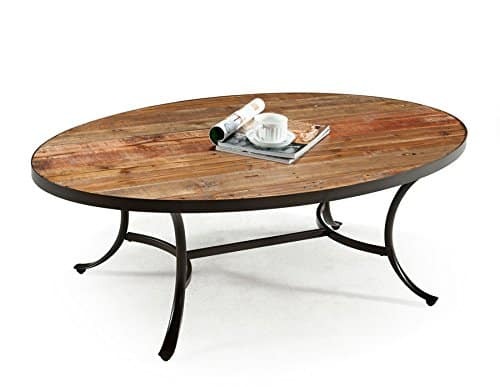 Let’s first start with my personal favorites the rustic coffee table and the reclaimed wood coffee table. These tables are practically one in the same with a few very slight differences. These tables are great pieces for those looking for a more laid back and “quiet” look to their living room. The best part about these tables is that they go well with almost any style and color of furniture. This is why they are my favorite you can’t go wrong! It certainly makes it easier when it comes to making the right selection. Now if your unfamiliar with the terms “rustic” or “reclaimed” it simply means that it’s a wooden coffee table with a more “rough” or unfinished look to the wood. However, you can certainly find some with a treated finish. I received a lot of positive comments on this particular rustic coffee table. It’s different but in a good way! The pros about these tables is that they have perhaps the largest selection of styles available. Don’t want a rectangular one? There are round ones available (to help keep the children safe from those corners). In need of more storage? (aren’t we all!) You can get one with storage drawers. The only con I find with these tables is the need for using a coaster all the time. Still great when you’re enjoying an ice cold glass of lemonade. As you know moisture and reclaimed wood don’t go well together. 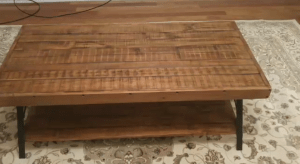 A waterlogged table probably isn’t what you had in mind when choosing a coffee table. Don’t let that dissuade you, the versatility of a reclaimed wood coffee table makes it all worthwhile. Overall these types of tables are great due to that vintage look they give a room. Nice glass table outlined in chrome. Check out that nifty little storage space! You can also go with a glass coffee table. 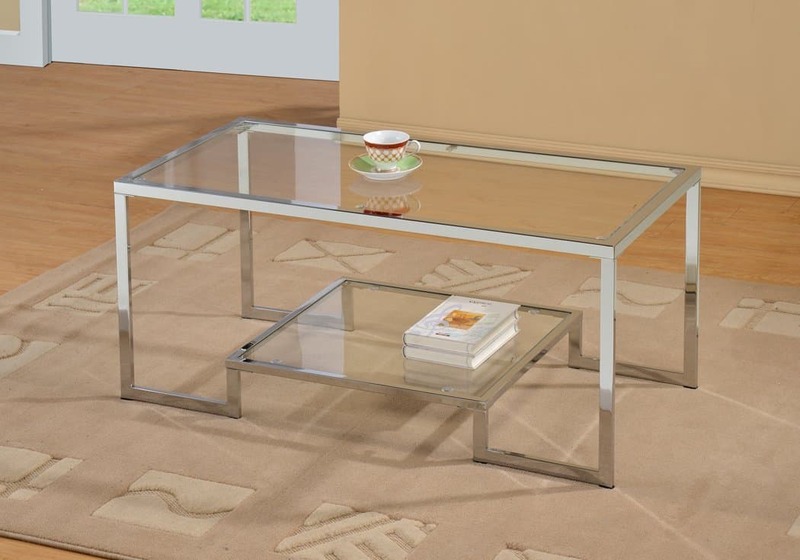 The advantage of glass coffee tables is the effect they give a room. It makes your living room appear larger as the focus is drawn away from the table due to the glasses’ transparency. The downside is the fragile nature of glass as you know. Special care should be taken with these kinds of tables especially when transporting or when around children. If your running low on time you can check out my blog posts here where I discuss in more detail the various types of tables available and compare what I believe are the best ones from their respective categories. I’ll give my final thoughts and recommend which one I believe to be the best. I do suggest that you finish reading the material below as this will help you in making the best choice coffee table for you personally. Of course as you may have guessed already this depends. I discussed earlier a quick “back of the envelope” method for getting an idea of roughly what size table you need. Depending on the size of your living room this will vary but generally your standard coffee table is 24 x 48 inches. First consider the footprint or amount of space available in the room the table will be set in. Make a mark with some tape or something similar to outline the coffee table geometry you are considering. The reason for this is to give you an idea of how the size of the coffee table will affect the entirety of the room. Including the furniture. Size does matter with a coffee table. A coffee table is usually the first thing you notice above all else (mainly because it’s right at the center of the room) so you want to make sure the footprint you’ve outlined satisfies your personal taste. Does this size help to bring the room together? Does it allow enough passageway to get in and out comfortably without compromising the use of the coffee table? These are the questions you should be asking yourself when deciding on the dimensions of your coffee table. As for height again you guessed it this depends. Generally speaking, though you do want your coffee tables height to be a couple of inches lower than your surrounding furniture. Remember you want to be able to set things down on the table and not make a mess spilling drinks by crashing into the lip of the table (work with gravity not against it). You can also choose to go with a table that is lower than “standard” height, you’ll give the effect that the room is larger than it appears similar to the glass table top. This “below standard height” table also gives a peculiar effect of making surrounding objects appear taller than they actually are, perhaps because they don’t block things from view. Either way these can look great too. Should I choose a rectangular coffee table or one that is rounded? This usually depends on your sofa. In general, a good rule of thumb is if you have a long rectangular sofa you want to stick with a rectangular shape. This will help to achieve the “connectedness” of the room. One drawback about rectangular and even a square shaped rustic coffee table is they obviously have corners which could be dangerous if you have small children. This can be avoided by going with a rounded table. The problem would then be trying to make it fit. Try to match your sofas shape with your coffee tables shape. This is pretty easy. Just like matching shapes it makes sense a circular type of sofa would look best with a rounded coffee table. It would also help everyone sitting on the sofa reach the table comfortably. If you want the best of both worlds you might want to consider an oval shaped table. You can try and get the best of both worlds by going with an oval shaped table. I will admit that an oval shape is not my favorite as it leaves an “unsatisfactory feeling” with a table that gets narrower and narrower the closer to the ends you go. This would however fill in the footprint necessary for your living room without those edges. I have 2 children ages 7 and 9 and have never had an issue with my rectangular shaped rustic coffee table. Still take precaution especially when considering the safety of your children. There are other options out there if you don’t want to compromise on the rectangular shape of the table. You could always go with an ottoman coffee table. These tables are made of a soft cushion like material finished in velvet and they also offer leather ottoman coffee tables. If you’re interested in this kind of table, I discuss them in more detail here. Another great example of the various coffee tables available. This ones called an ottoman and you can read more about them here. If you’re like me who has various junk drawers and still not enough room to put things in, then you may want to consider a coffee table with drawers. If you’re a well-organized person who doesn’t lose things, then this probably isn’t an issue for you. However, it is always nice having that extra storage space for throwing random items or books and magazines in. 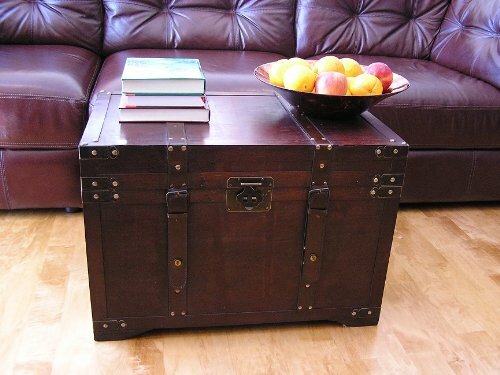 If you need much more storage than any drawer can provide then take a look at some trunk coffee tables I’ve written about here. The only problem I find with storage drawers on some coffee tables lies in the fact that the edges now have a lower lip. This can be a bit of a nuisance if you tend to sit too close to the table. The painful memories of smashing shins come to mind. As we discussed earlier though this shouldn’t be a huge problem. After all we now know how to properly space our table from our sofas! It’s all about trial and error so again don’t worry if you feel like you can’t find that “perfect” table. You’ll make it work. How to care for your rustic coffee table. So once you selected a coffee table whether it be a rustic coffee table, reclaimed wood coffee table, glass coffee table or acrylic you’re going to want to take care of it. Here are some pointers I’ve outlined below. For a rustic coffee table or reclaimed wood coffee table. Use a coaster. Don’t need “puffy” spots all over the table from moisture absorbed by the reclaimed wood. Keep heavy objects with sharp edges away. The last thing you want is an unsightly chip exposing the bare wood within now do we? Keep that dust away. Use a nice polish to keep the wood clean and treated this will help to maintain and extend the life of your table. Don’t set any heavy or coarse objects on the table as this could scratch the finish. As you know glass can scratch fairly easy. Even micro scratches will be visible in just the right light so be careful. Wipe those fingerprints early and often. Glass attracts fingerprints so keep these clean and clear from the table. Worst case scenario is neglecting a fingerprint for an extended period of time and having a tough time removing it later. Hulk do not smash! This one is pretty obvious but don’t slam or throw heavy objects on a glass table as it could crack or even shatter the glass! As far as acrylic tables go the above applies as well. Ottoman and leather is a bit more complex. You can find what you need about these by going here. Keep these practices in mind and your table will last a lifetime. 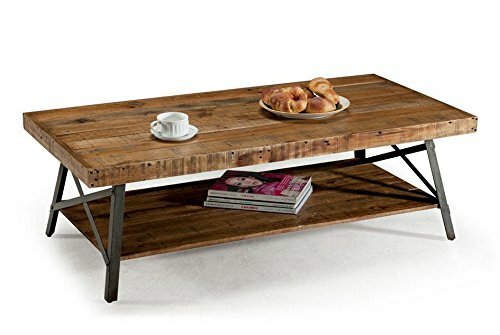 My Final thoughts and personal recommendations on some coffee tables. I hope by now you have a much better understanding of what to look for in a coffee table. If you’re still a little lost or unsure then keep reading. My intention when writing this blog was to help the new home owner with some interior design and home décor. Even if you’ve owned your home for many years perhaps you just need some pointers on what to do next. All are welcome here. 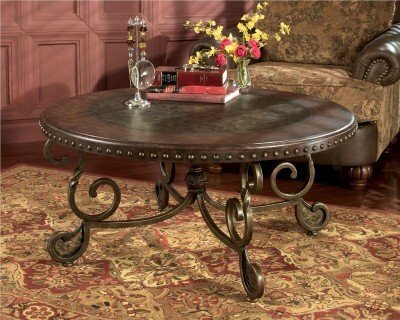 Wrought Iron coffee table. If you want to see more of these you can check them out here. If you’ve made it this far and read all the above and are saying to yourself “Vincent there’s just too many options to choose what would you go with or recommend?” Well you know by now that I would recommend to you a rustic coffee table or a reclaimed wood coffee table. Well your saying “that’s great but aren’t there a like a million different variations of these?” That’s true! (well maybe not a million) Nevertheless there are all kinds of these available some with storage some without rounded or not… I think you get the point. I’ve gone into more detail in this post over some of the best rustic coffee tables and reclaimed wood coffee tables around. I also go into more detail over the various ones available and recommend what I believe is the best one for you. Still set on something else? Now if your set on a table other than a rustic coffee table or reclaimed wood coffee table then hey more power to you. I’ve also compiled a list of these showing what I believe are the best ones including a glass, acrylic, ottoman, metal, and even a trunk coffee table. You can check these out by clicking here or going to the navigation menu above and hovering your mouse over “blogs” to see them one by one. I’d like to thank you for stopping by and reading my blog. If you have any questions or comments, please use the contact form to send me an email and I will get back to you asap!